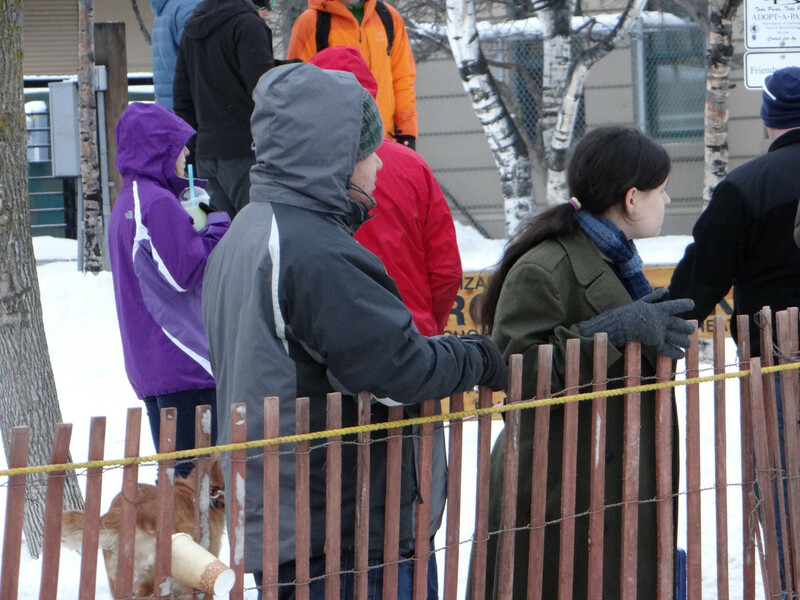 Person with a fur hat getting ready to watch the outhouse races. 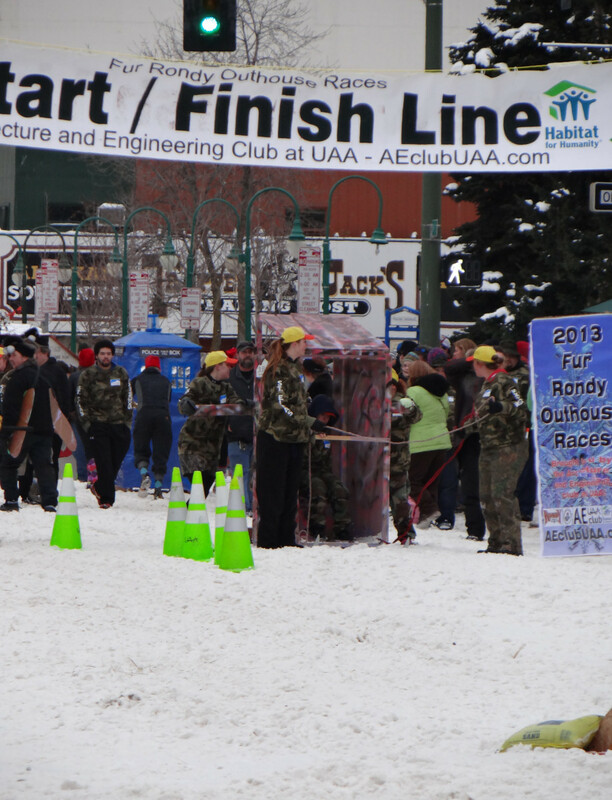 Fur Rondy or Fur Rendezvous is an annual winter festival held here in Anchorage. People wear lots of fur and fake fur hats. You'll see lots of animal head gear, both made from real animals with heads and claws intact and stuffed fleece versions. 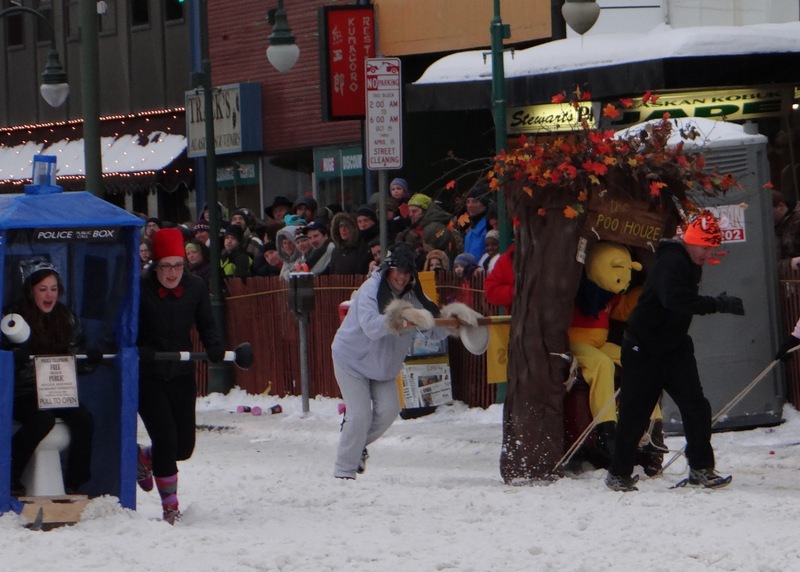 Various events take place all over the city including a fur bikini contest, a Duck Tape ball, a carnival complete with rides, ice sculptures and tons of other things. 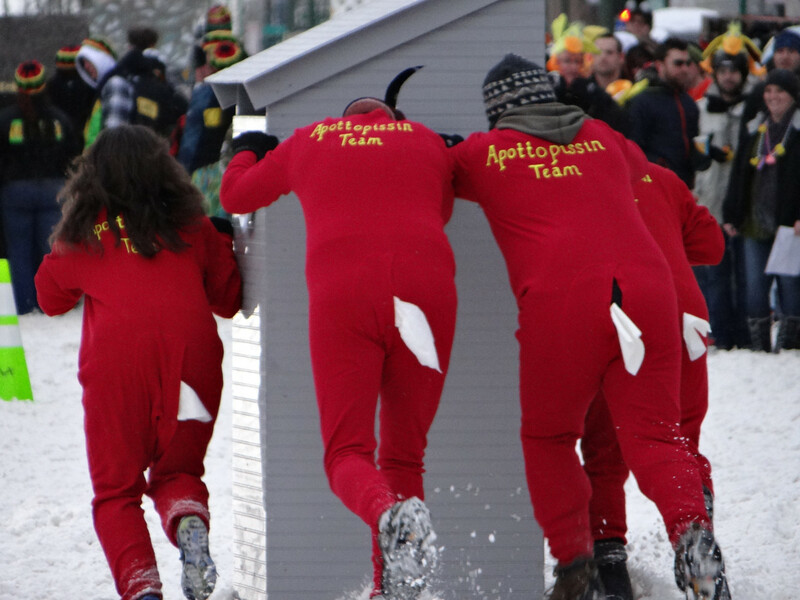 Including outhouse races. William and Turnip Girl watching the races. Yes, we do that here. Race outhouses. 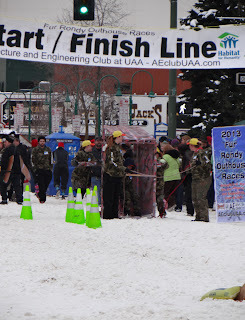 Teams build outhouses, usually sponsored by local businesses or organizations. It's a fund raiser and riotous fun to watch. The outhouses are mounted on skis, and one person sits on the "throne" (with straps because spills tip overs do happen). 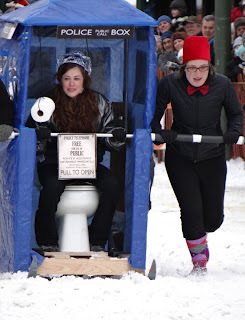 The outhouses can be very clever jokes, or just completely silly potty humor. The images are resized for quicker loading, but clicking on the images will bring up bigger versions to see more detail. If you were a racer and want a full sized version of one of the photos, just email me at shala AT donteatthepaste *dot* com. 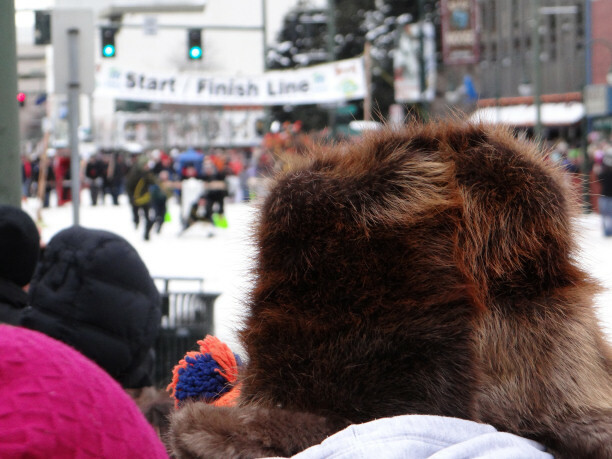 The teams start at the startling line, and the runners take them to the other end of the short track, turn around, and run back to the line. It was chilly, and we missed the parade that kicked off Fur Rondy events in the morning. 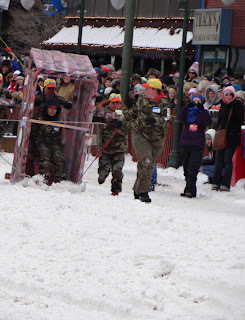 But TG was thrilled we had made it to the races when we spotted this outhouse. Yes, that's a T.A.R.D.I.S. 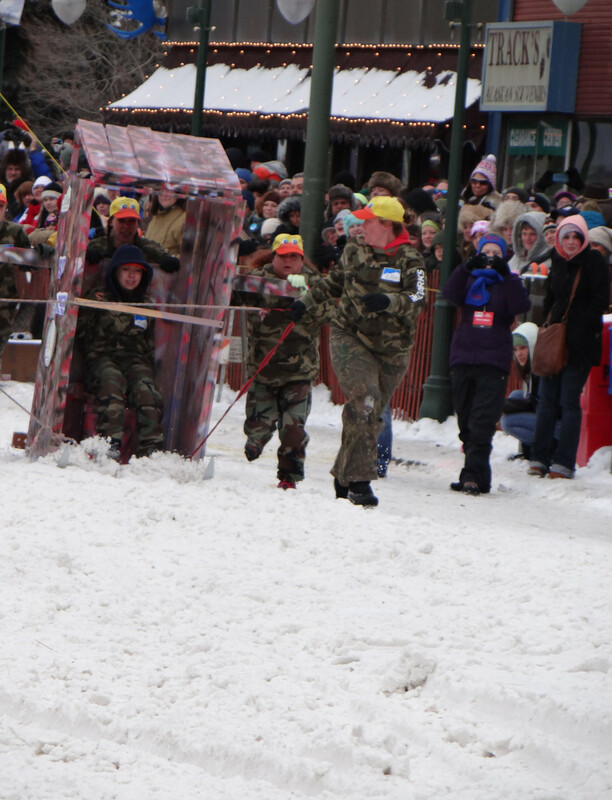 outhouse racing down the street. I had to laugh out loud at this very unlikely race. My husband got a kick out of this entry. The name painted on it was Kulluk! 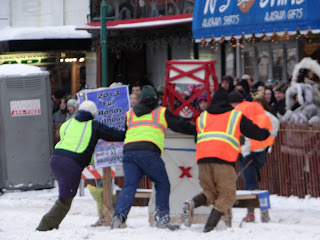 It was very crowded, and when we got downtown and parked, a nice lady with a dog from Missouri asked us if anything was going on, she was afraid she missed any Fur Rondy excitement, and followed us to the races. Since the races take place on the same street/block as Grizzly Gifts, I also ran in there for a minute to pick up some extra lip balm for my husband. He's picky, he likes the kind I make, or the kind made by Silverbear Sundries who do sell at Grizzly Gifts. A man from one of the villages came up to us selling a jar of smoked salmon, and Michael bought it. It was fairly chilly out, and my feet were freezing.When everyone else was chilled, we went to Kobuk Coffee Co. and got some tea, and the traditional rum cordials which are a family tradition when we are downtown (non-alcoholic). Then we went to Peggy's for dinner. Driving back, we got to see the fireworks over the harbor, and it was snowing which didn't photograph well but it was beautiful. Toilet and Relative Dimension in Space..LOL Was it bigger on the inside???? This looks like such a fun day. It really was a lot of fun! I'm not sure if it was bigger on the inside or not.